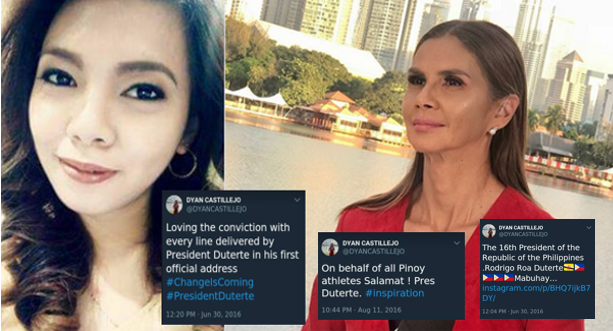 Athlete and news reported Dyan Castillejo is indeed shrouded with controversy after she called President Rodrigo Roa Duterte “your president” in an interview with Senator Manny “Pacman” Pacquiao. It was right after the match with Lucas Matthysse when Castillejo was at a lost of words and began stating the controversial line that lead to a thought that she was being disrespectful. Now some netizens beg to differ, on the contrary, Castillejo was being respectful. She fully supports President Duterte as netizen Demi Salvador stated in her Facebook posts that cite references of the news reporter’s tweets that show respect and recognition of the President. Below are the tweets and links that Salvador cited as reference to Castillejo’s respect and support towards President Duterte. Apparently Salvador pointed out that Castillejo was in a bit of a jiffy. She is being bashed by both sides now, pro and anti-Duterte people which probably stresses the reporter out. With this understanding, the netizen defends Castillejo as she was misunderstood and that her true colors of a Duterte-supporter. Salvador followed up on her post, commenting a reminder. “Tama na guys. As long as Dyan is not expressing direct hatred to our president, let's forgive her and focus all our hatred to the liberal party and cbcp,” she stated. Some DDS posted to inform us that Dyan is actually supportive and appreciative of the President. For all we know, the Your President remark was a plain mistake. But she quickly recovered and pointed out to Pacman that PRRD was in the stands and that he was giving him the thimbs up sign. My own guess is that Dyan's producers who were likely on her headset did not want her to acknowledge PRRD. But being a professional, she eventually did the right thing after a minor slip. Let's not sow hate against a decent human being and professional. Magulang kasi mga dilaw, so I understand why some of us are very defensive and quick to anger. Let's not lose our heads over a simple mistake like this. We are better than this guys. In totality, the political sidings of Castillejo seem to lean on the government’s side. But there may be a possibility that her producers weren’t. Even so she was respectful enough to go out of her way and recognize the President, so let’s not overlook this fact.